Earlier today we updated our Stock Scores which ranks the stocks in the S&P 1500 on a technical, fundamental, and sentiment basis. 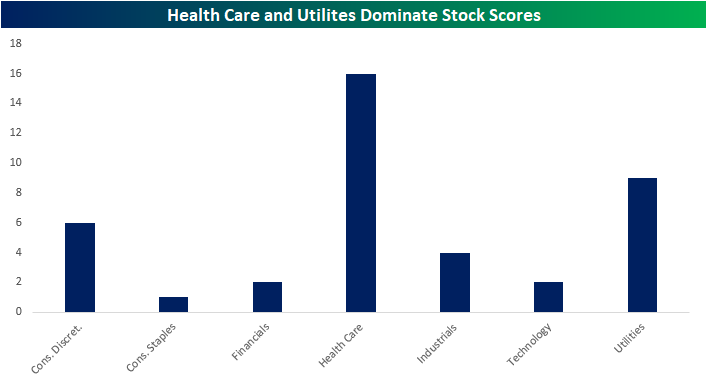 The top stocks this week are heavily represented by the Health Care, Utilities, and to a lesser extent, Consumer Discretionary sectors. Of the top 40 stocks in the S&P 1500, 16 are the Health Care stocks, including Regeneron Pharmaceuticals (REGN) which holds the top spot this week with a strong score of 85.83 (out of 100). REGN’s top score is timely as it tops the list just ahead of its earnings report tomorrow morning. In fact, a few of the top-rated stocks that come from these sectors are set to report earnings on Wednesday, including Chipotle (CMG) and Spire (SR). 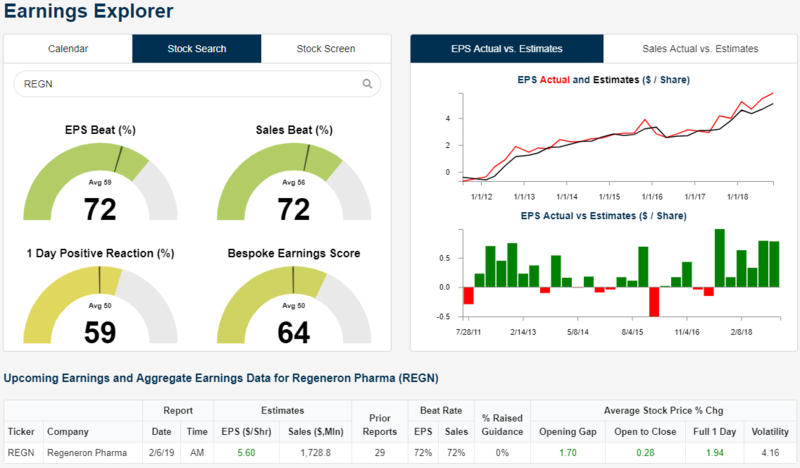 Using the Earnings Explorer tool of our new interactive site, Regeneron (REGN) has beaten both EPS and Sales 72% of the time. While it does not necessarily blow the lid off during Q4 earnings, it averages a gain of 1.94% on its earnings reaction day and is positive a little over half of the time. The stock is also coming off six straight quarters of EPS and sales beats. Given this trend, the company may very well hold onto its “perfect” fundamental score in our Stock Scores ratings while the strong technical setup (technical score of 93.1) could help the stock see a better reaction to earnings. Also reporting ahead of Wednesday’s open is Spire (SR). 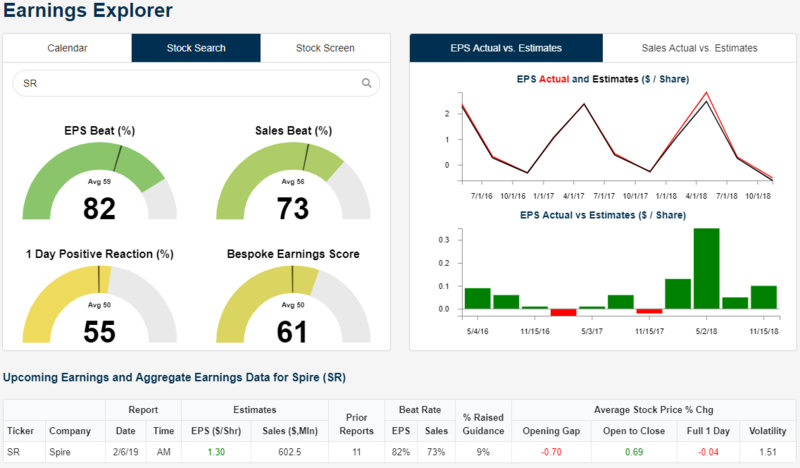 The natural gas distributor does not have too many reports under its belt (tomorrow will be its 12th quarter reporting earnings) but has beaten EPS 82% of the time. Despite this, the company on average has gapped down 0.7% but pares those losses, gaining 0.69% from open to close. The company is expected to see EPS come in at $1.30 with $602.5 million in sales. 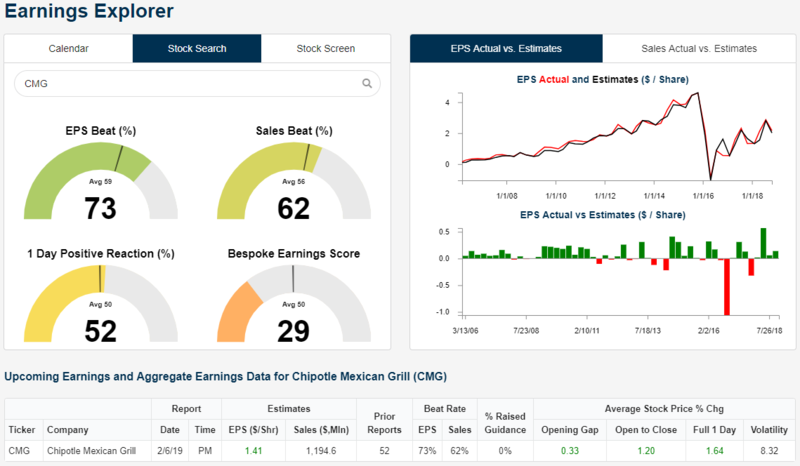 Chipotle (CMG) is set to report earnings after the close Wednesday. The stock is a bit conflicting this week as it has a very weak Bespoke Earnings Score of just 29, though the Stock Score is much stronger at 82.61, putting it at number three in the S&P 1500 Looking to Wednesday evening’s earnings report, though, it is hard to say how the stock will react to earnings seeing as the past few reports have been fairly inconsistent. Whereas the previous report saw a miss in revenues and an EPS beat, the stock rallied 3.42% on its earnings reaction day. On its prior report, CMG fell from open to close despite beating both EPS and revenue estimates. Go ahead and use our new interactive site and our popular Earnings explorer tool.